A loop through some of the western National Parks of America makes a great driving trip. ...this is one way to do it. If you want to see natural wonders... here they are. If you like hiking... there are hikes galore. When we have friends visit us from Europe, they love to make this driving loop if they have time. We love travel in America AND the rest of the world. Actually, we travel a lot in the U.S. too. We decided it was time to share some of our favorite destinations with our international readers..... you! In a week, you can drive a representative loop through Nevada, Utah and Arizona. The actual starting point for the loop listed in most guides is Las Vegas. For the loop through the western National Parks we're describing here, you will be driving about 1050 miles (1,690 km). You can fly directly to Las Vegas from many cities in the U.S.
You probably will want to spend a day or two in Las Vegas to gamble, see some shows, or just satisfy your curiosity about "Sin City", so allow time for that too. The first stop on this drive is Zion National Park. It is a deep canyon carved by the innocuous looking Virgin River. 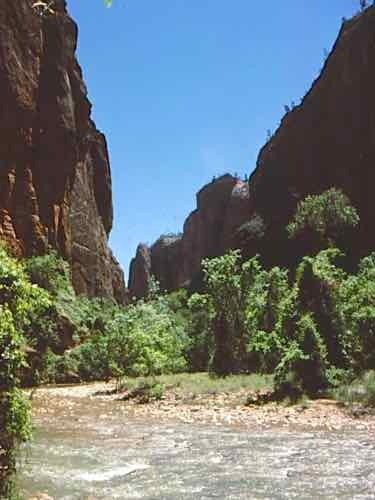 There's a great hike up this river into a slot canyon called "The Narrows Hike".... and the canyon does narrow to only 20-30 feet across in places. You will spend 60% of your time IN the river as the canyon walls soar above you. We loved this hike... it made us feel like real adventurers. If you're not up for that strenuous hike, there are other hikes that let you see much of what the park has to offer. Scenic drives let you see some sights by car. There is a Lodge in the park and more accommodations are available outside the park. Campgrounds are available. 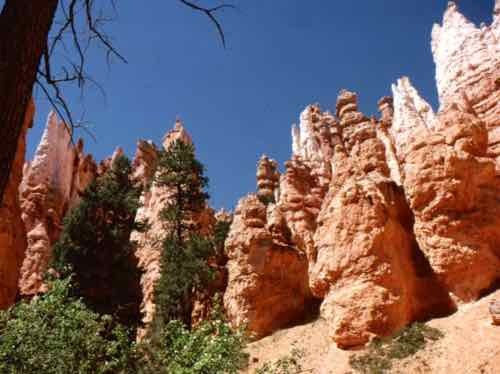 Bryce Canyon National Park is your next stop. It's certainly one of ours. It's famous for its colorful spire-shaped "hoodoos". A hike into the canyon will make you feel you've entered a fairy wonderland. This park has a Lodge in the Park and good lodging nearby. Two campgrounds are near the visitor center. The drive to Capitol Reef National Park follows along Route 12 and is very pretty. The main feature in this park is the formation known as the "Waterpocket Fold"... an ancient wrinkle in the earth's crust. No lodging is available in the Park. Find some motels about 12-15 miles (20-25 km) from the park entrance. Some camping is available in the park. You can pass though Natural Bridges National Monument. A scenic drive will take you to overlooks to view each of the three bridges that were formed by meandering streams. Allow a couple of hours for this. Lodging is about 30-40 miles away. There is a small campground available. You might want to make it a long day of driving and get to Monument Valley Tribal Park. This huge valley has those iconic wild-west sandstone formations that you've seen in the movies... "The Mittens" are the most photographed, but there are other pinnacles and arches, bluffs and buttes. 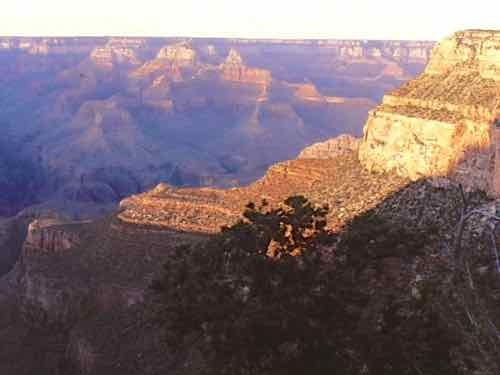 You can get guided tours from Navajo tour operators. There are accommodations in the area; the only one in the Tribal Park is the new hotel called The View. We're saving the most famous of the western National Parks for last. The Grand Canyon. Clearly this is one Western National Park that you must see. There is accommodation and camping available in the park and many options nearby with shuttles into the Park itself. This is such a popular destination that driving is restricted in the park in some areas. Parking can be a nightmare, so just use the shuttles. Another day of driving will have you back at Las Vegas. ...of the Western National Parks.